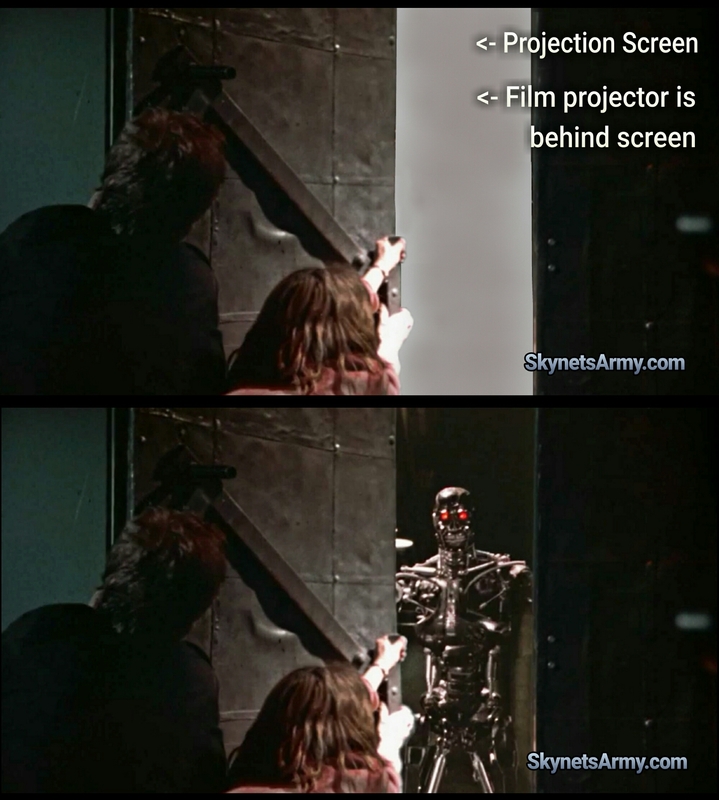 An in depth look at the stop-motion animation Endoskeleton effects used in “THE TERMINATOR”. 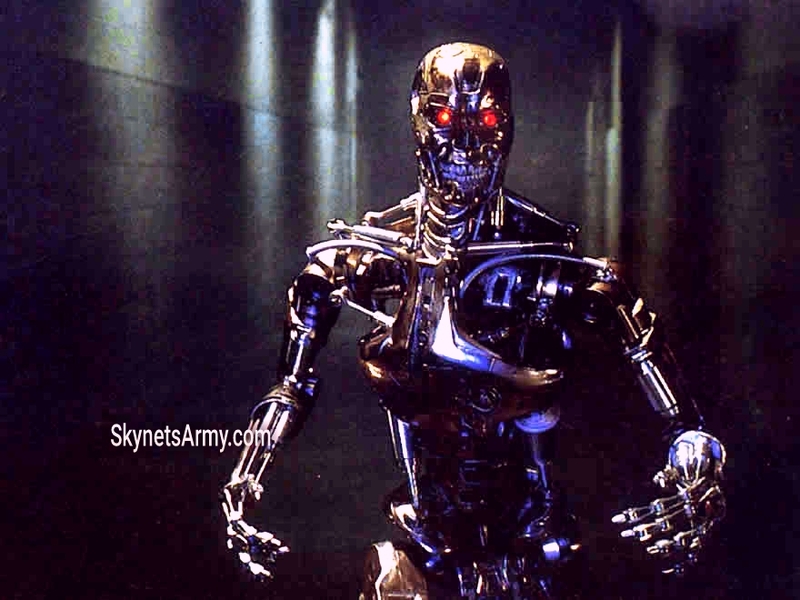 In late 1982, when James Cameron’s dream film project “The Terminator” was finally greenlit with a initial budget of 4 million dollars, Cameron knew his biggest challenge would be bringing the T-800 Endoskeleton to life for the film’s finale. 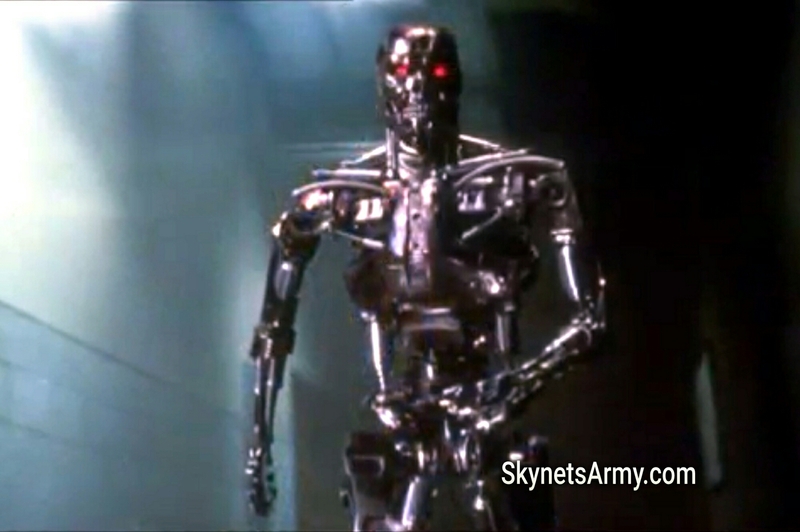 With the groundbreaking filmaker’s tool of photo-realistic Computer Generated Imagery technology (CGI) still years away, Cameron envisioned creating all the T-800 endoskeleton shots with stop motion animation technology. Stop motion is an animation technique where an artist physically moves a doll or puppet so that it appears to move on its own. How it works is the puppet is moved in a small increment, photgraphed in a single frame, then moved slightly and photographed again. Repeating this process over and over again creates an illusion of movement, when the series of film frames is played in a faster sequence. 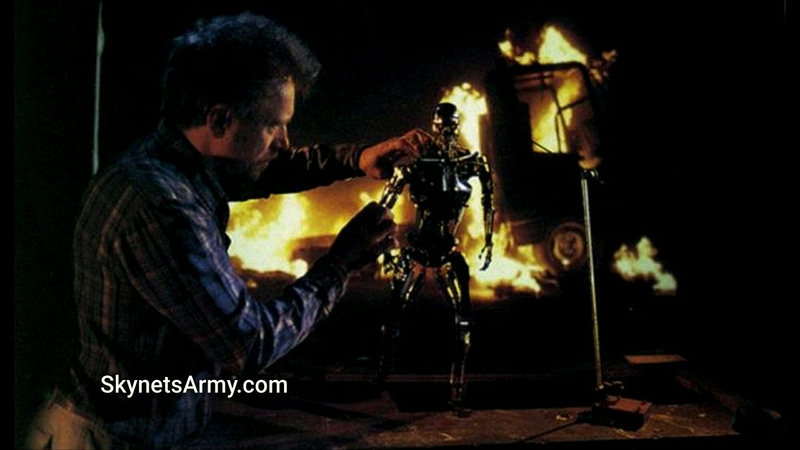 Even though it was James Cameron’s plans to film all the T-800 Endoskeleton shots with stop motion technology, the late special effects creator Stan Winston convinced Cameron that he could create an animatronic and puppet endoskeleton in full-size and get a lot of onscreen performance out of it. 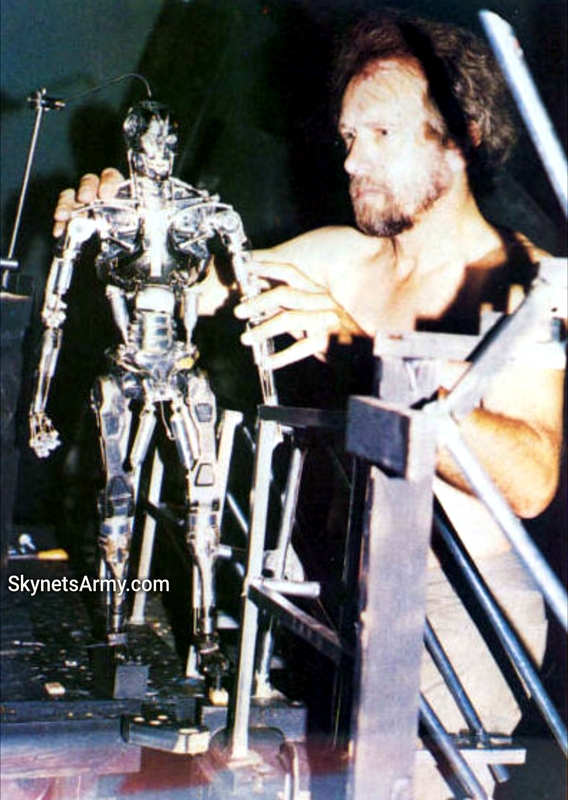 The great Stan Winston turned out to be correct, and Fantasy II Special Effects Supervisor Gene Warren later admitted that Stan’s animatronic work saved them another 6 months of stop motion technology post-production work. 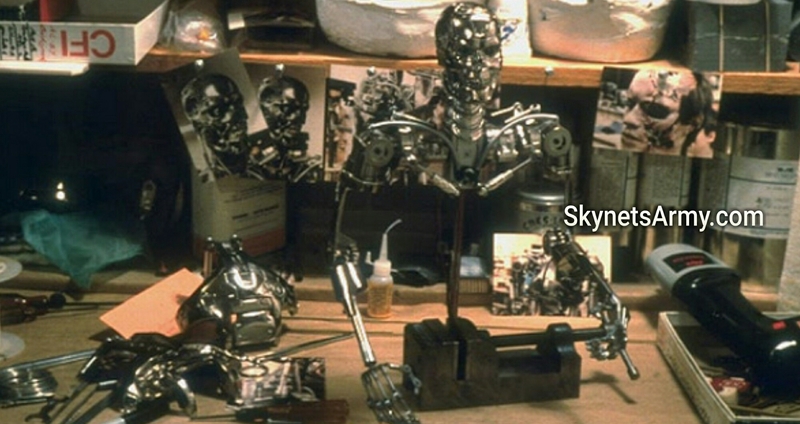 While the effects Stan Winston’s team created were terrific, a number of scenes of the T-800 Endoskeleton still needed to be achieved through stop-motion animation when the shots required the full T-800 in motion. 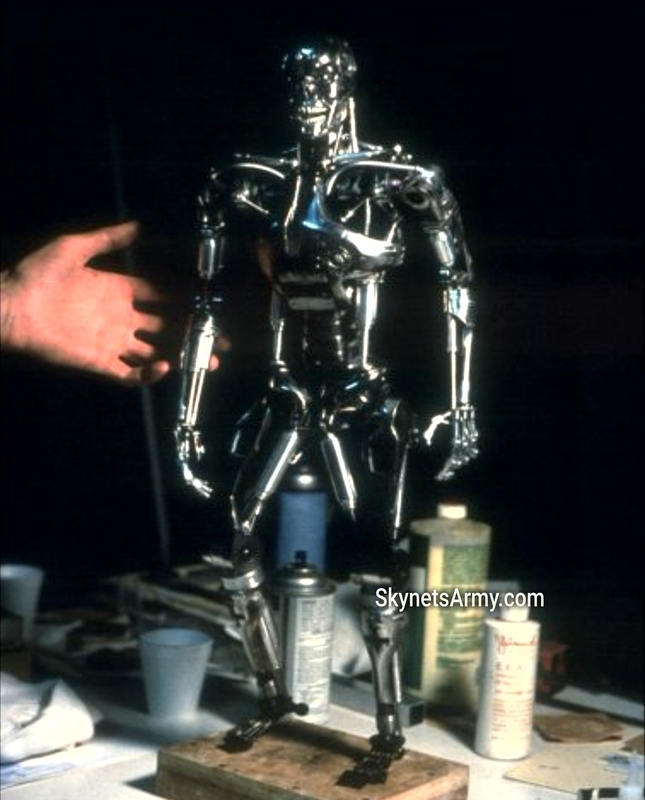 That’s where Doug Beswick came in, who was the head of the construction team tasked to make the miniature T-800 puppet. 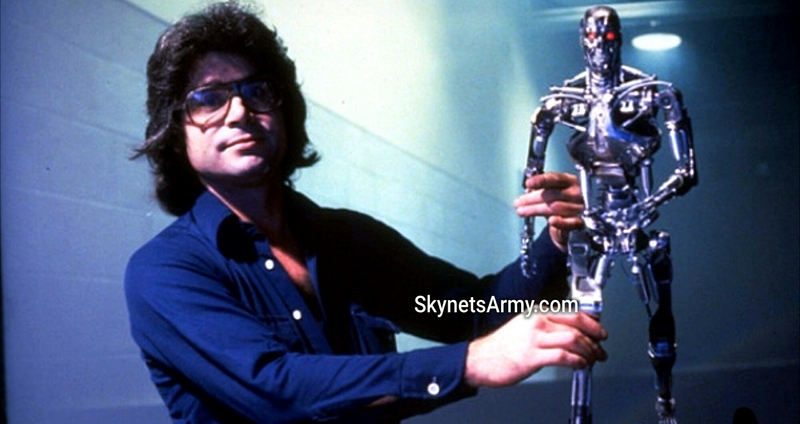 Created with more than one hundred individual parts, the tiny T-800 components were mostly machined out of aluminum, and some pieces were so tiny they needed to be carved and sculpted by hand. 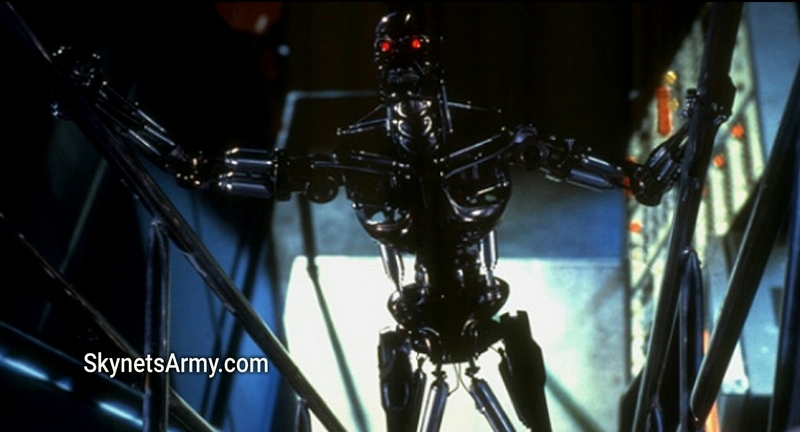 To support the body, the endoskeleton feet required extra strength and were ultimately made out of steel. 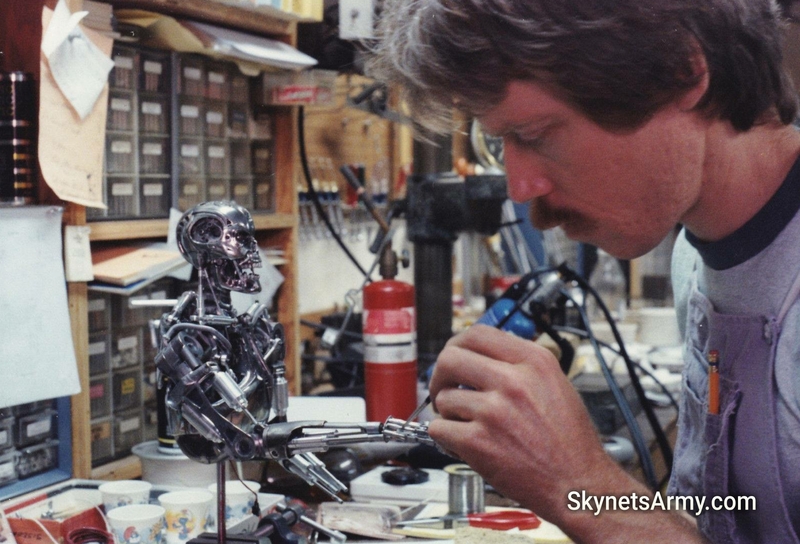 And once all the individual T-800 pieces (painted with a chrome finish) were finally crafted, it took Beswick and his team almost a full two weeks to assemble the puppet. 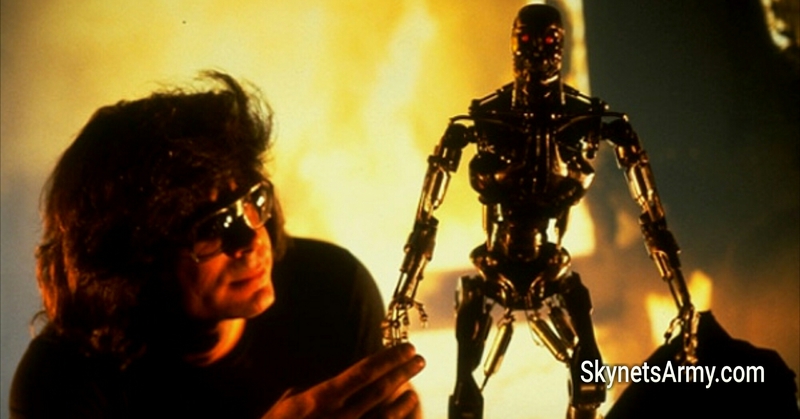 The completion of the puppet was finished six weeks behind schedule, reportedly because Stan Winston’s team ran late completing the T-800 design. 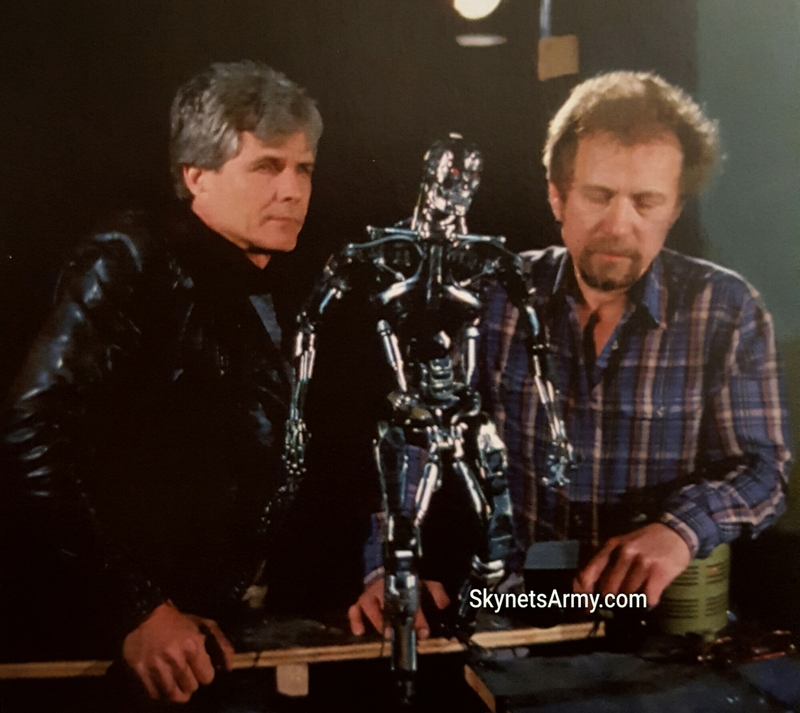 The delay added extra pressure to the stop motion animation team, because FANTASY II had to complete some of their T-800 shots before James Cameron started filming! This is because Cameron planned on using rear screen projection technology during the filming of the climax. Often called “the original green screen technology”, Rear projection is an in-camera effect where a director takes a pre-filmed scene, and plays it in the background of a scene he is filming now. Imagine actors acting in front of a large projection screen, and a film projector is playing behind that screen, projecting images on it. With the film camera locked in place, the projected background footage and the new foreground filming can blend together seamlessly for a truly stunning result. 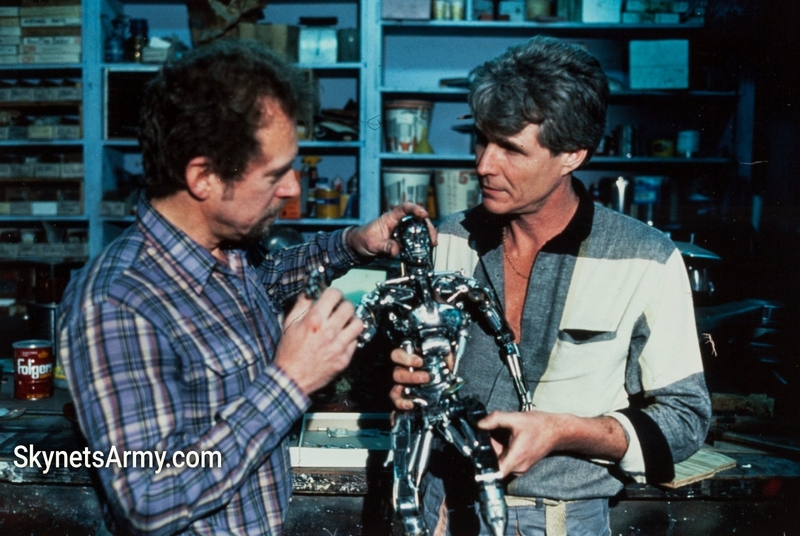 Six weeks behind schedule, and racing to complete an assortment of stop motion animation shots before filming of the movie’s climatic finale was to begin, FANTASY II’s Peter Kleinow and his team began animating the puppet that Beswick built. Peter Kleinow had to match the film’s 24 frames per second speed, which results in a very laborious process. 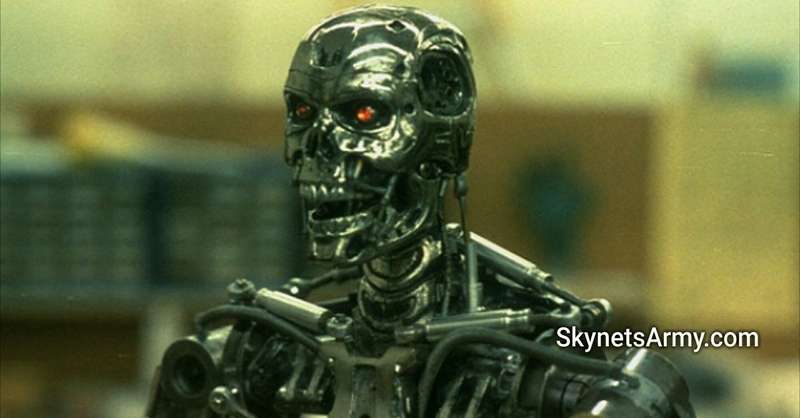 This is because Kleinow had to slightly move the T-800 Endoskeleton puppet and take its picture 24 times for every second the robotic nightmare would appear on screen. 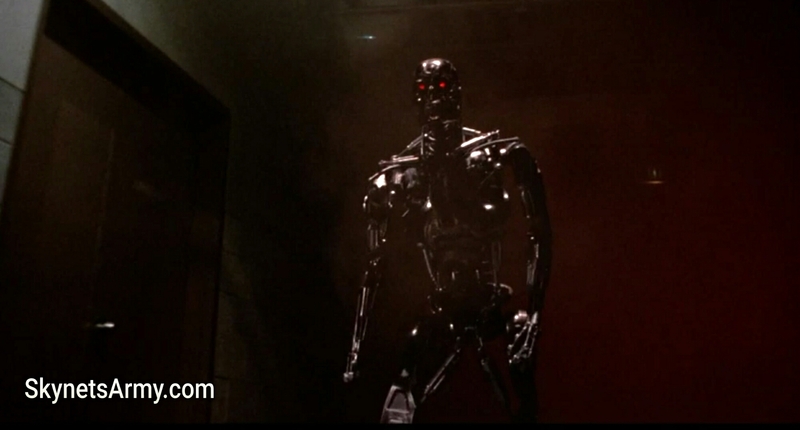 One aspect that worked in Kleinow’s favor is the T-800 had a limp. Often, in an effort to achieve utmost believability with their effect, a stop motion animator would have to study an actor’s gate (Arnold Schwarzenegger’s walk) to mimic it as best they can. 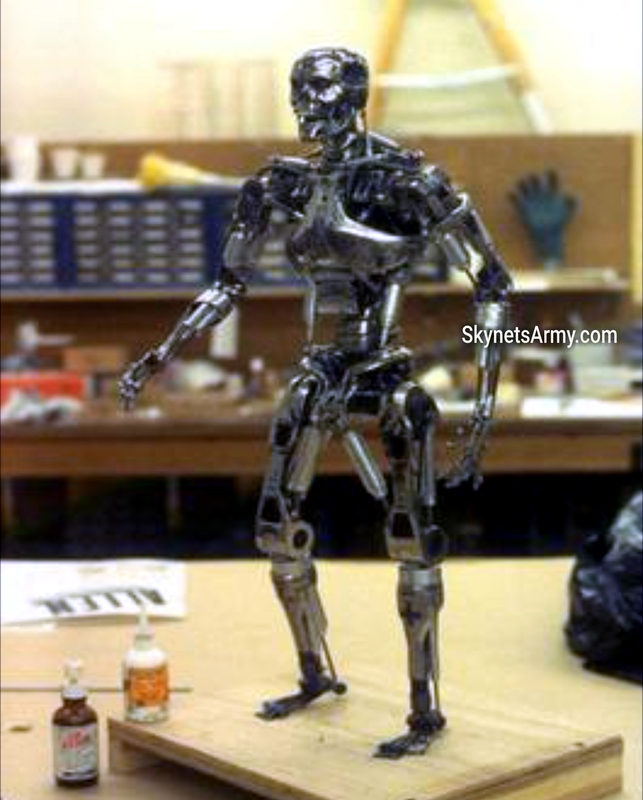 But duplicating the struggling walk and limp that the Terminator acquired after being hit by a truck was extremely helpful in making the T-800 animated puppet appear more believable to audiences. Kleinow also had a trick up his sleeve when it came to blurring the endoskeleton puppet’s quicker movements. Why he wanted to blur its movements is when live action is captured on film, a fast moving object often tends to appear blurred. 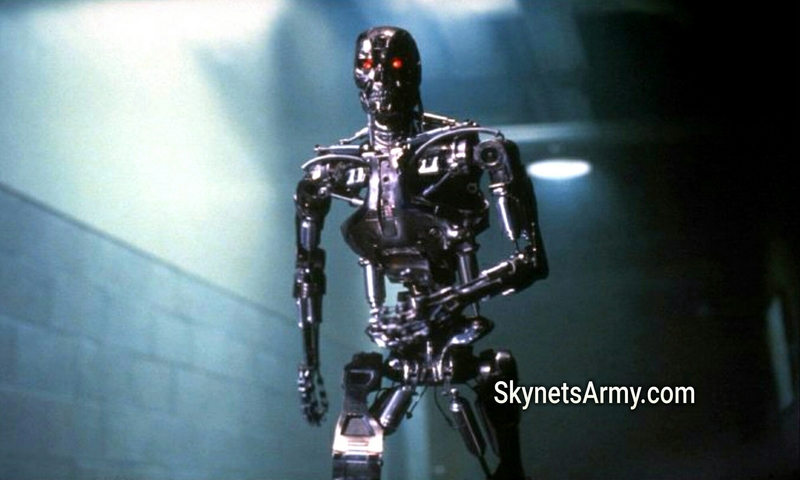 However when animating a fast moving Terminator one frame at a time, it will never blur, so blurs needed to be added artificially. How Kleinow achieved this blurring effect was simply placing a pane of glass between the camera and the puppet, then smearing the glass slightly with Vasoline. 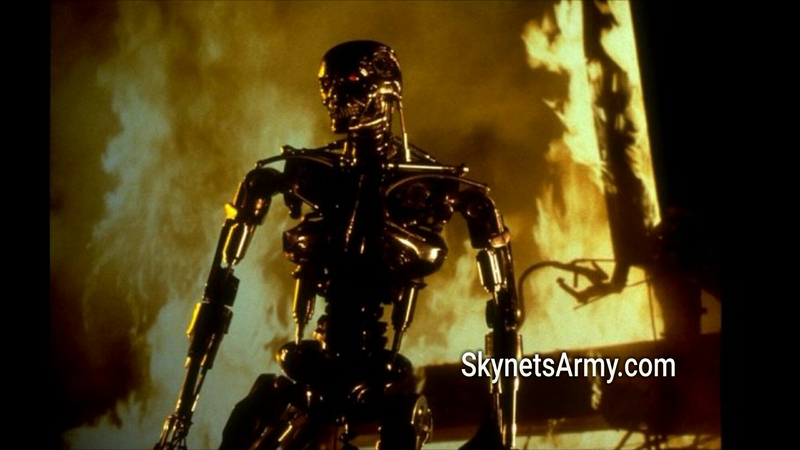 Fortunately, not all the T-800’s stop motion animation had to be completed before James Cameron’s principal photography. Some of the animation had to be completed after filming. This is because Cameron filmed background footage for Keinlow and his stop motion animation team to use in their shots, like the fiery tanker wreckage. 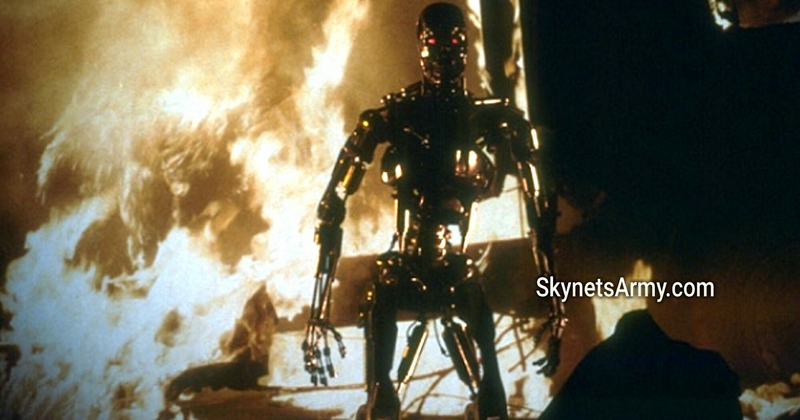 Implementing the same rear projection technology that James Cameron used in his filming, Peter Kleinow and his team projected the wreckage footage on a screen plate behind the endoskeleton puppet one frame at a time. And every time he moved the puppet slightly, he would advance the footage one frame as well. Once Kleinow would take a photograph of the puppet and the footage together, he and his team would repeat the process. The end result became one of the most iconic scenes in the movie. The biggest challenge came when Kyle Reese confronted the Terminator on the raised walkway. Using rear projection, previous filmed footage of actor Michael Biehn attacking an empty space (i.e. 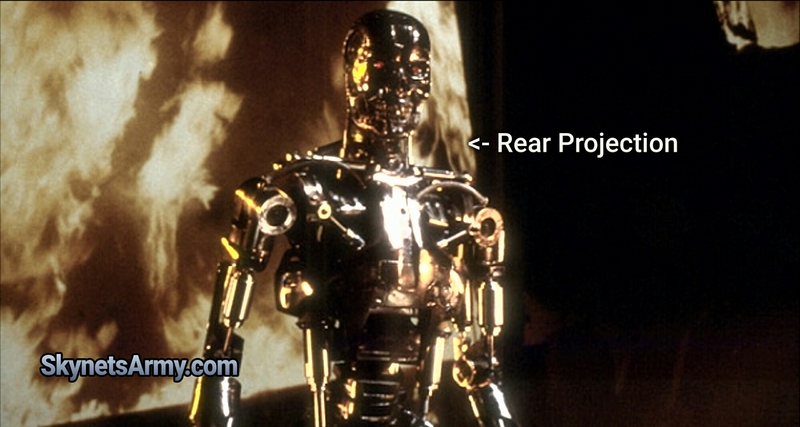 an imaginary T-800) was projected one frame at a time in the background of the endoskeleton puppet. 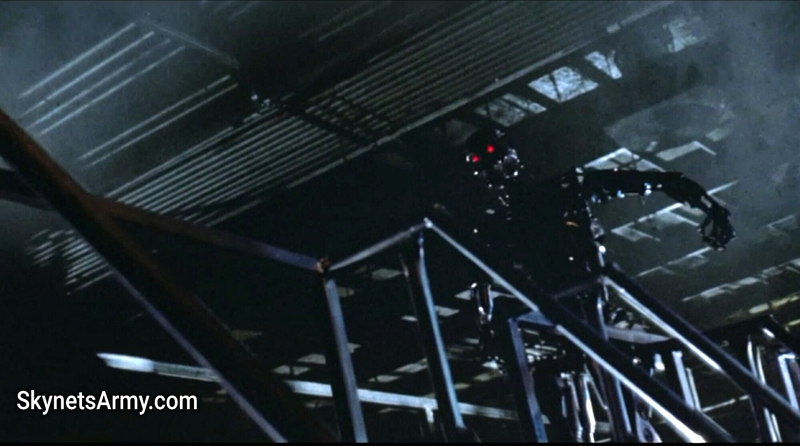 With the puppet in the foreground, Kleinow had to create an illusion that he was up on that raised walk, which means the walk’s handrail needed to be infront of the Terminator. So Kleinow and his team had the complicated task of recreating a portion of the raised walk in an exact scale minature, giving the appearance that both the Terminator and Kyle Reese were up there battling together. It was painstakingly laborious effort to get the shot to line up right, but the results proved to be worth it… and James Cameron was very pleased. 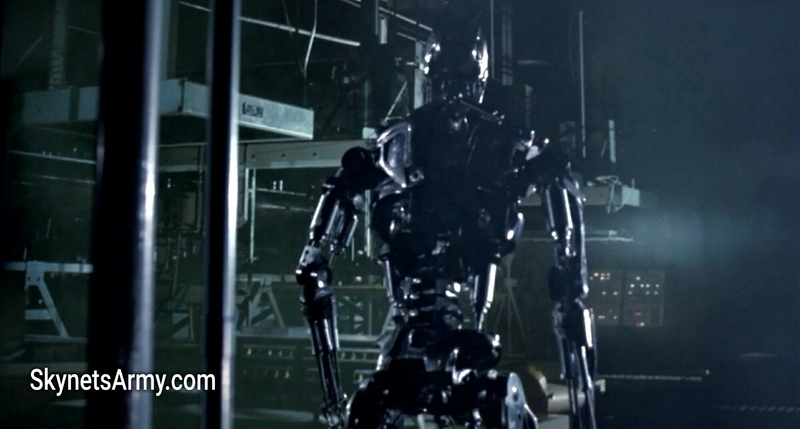 We hope this in-depth look has given Terminator fans a new appreciation for all the hard work and ingenuity it took FANTASY II to bring the iconic Terminator endoskeleton to life. Some fans have expressed interest in James Cameron updating these effects in his iconic 1984 film, like George Lucas had previously done with his original Star Wars trilogy. While the effects might look antiquated by today’s standard, we hope these effects will be eternally perserved in the annals of film history, never forgetting the amazing work these artists created. Previous PostA Fan Review of “TERMINATOR 2: JUDGMENT DAY 3D!”Next PostSix Countries now have OFFICIAL RELEASE DATES for “TERMINATOR 2: JUDGMENT DAY 3D” including the U.S., France & Australia! Cameron please do not ever meddle with these effects. This must remain as a testimony to their craft!